Who on here doesn’t love a good potato? Well… If you were one of the few that said “ME! I DON’T!” then you should probably stop reading right about now, but if you continue reading then I promise you, you are sure in for a real treat. On a trip to Uruguay last December, I came across a potato as I had never seen it before. Advertised as just a regular baked potato at the incredible beach restaurant La Hueja, the entire table of 8 was so pleasantly surprised that we of course had to go ahead and order another round. Thats how we do it my family, rounds of potatoes instead of shots… actually thats a lie, were big fans of both. These potatoes use two methods of cooking, boiling and roasting, allowing for them to get super fluffy inside and extra crunchy on the outside. It may require a little patience as there are a few steps over a few hour time period but stick to the recipe and you’ll be counting your lucky stars! You can thank me later! Heat a large pot of water until boiling, add the potatoes and cook for around 30 minutes until soft. You can also place them in the microwave with a little water for 12 minutes for a short cut. 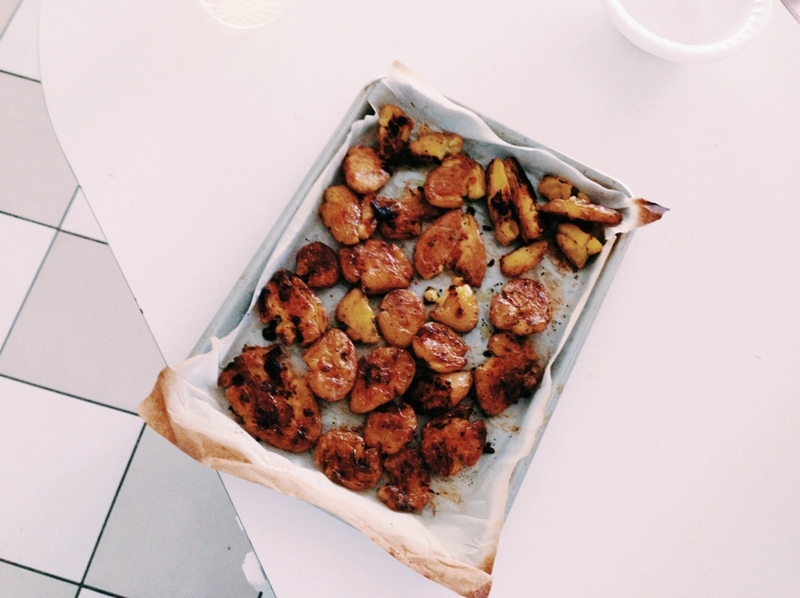 Line a baking sheet with greaseproof paper, wait for potatoes to cool slightly and place on the sheet. Place another sheet of greaseproof paper on top of the potatoes then place another baking sheet of the same size on top. Press down on the baking sheet a few times until the potatoes remain whole but squashed and slightly broken. Take off the baking sheet. Roast potatoes in oven for 40 minutes until brown and crunchy.